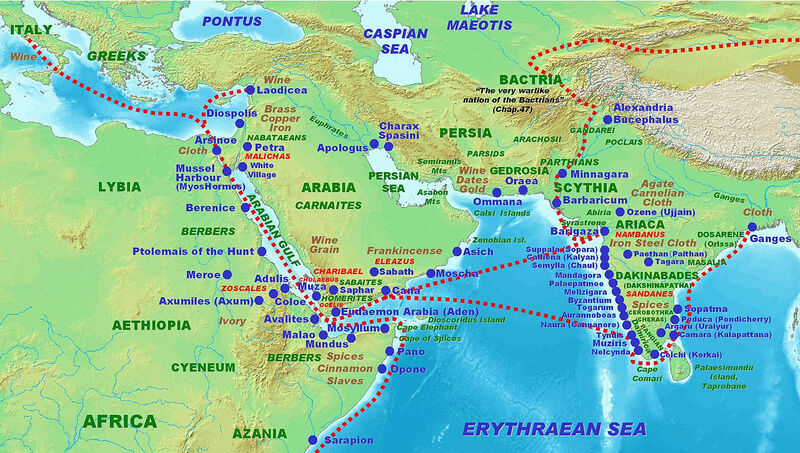 Roman ships leaving the Indus region sailed hundreds of miles south to a port in Gujurat called Barygaza. This was a treacherous sailing for the deep-hulled Roman vessels that might run aground on underwater hazards and be torn apart by powerful currents. The Periplus warns that east of the Indus was a bay called Eirinon where ‘there is a succession of shallow eddies reaching out a long way from land. Here, vessels often run aground with the shore nowhere in sight’. Roman ships might also be drawn by ocean tides into the Gulf of Barake (Kutch). The Periplus warns that ‘vessels blundering into the basin are destroyed, for the waves are very big and oppressive. The sea is choppy and turbid with eddies and violent whirlpools.’ The crews of Roman ships caught by these currents threw down restraining anchors, but the coast had sheer drops and sharp rocky outcrops that sometimes cut their anchor lines. These dangers have been confirmed by the discovery of Roman amphorae fragments and the remains of lead anchors on the seabed near the island of Bet Dwarka. An indication that the ship was close to currents came when the pilots sighted ‘sea-snakes, huge and black, emerging to meet the ship’. Most Roman ships would head out to sea and only re-join the coast when small golden-yellow eels were seen in the waters about their hull. This was a sign that they had reached the Cambay Gulf which led to the city-port of Barygaza. Barygaza was ruled by a dynasty of Saka kings who came from homelands on the Asian steppe. The Roman Emperor Augustus received envoys from these Sakas in 26 BC, when he was campaigning in Spain. Suetonius explains that these Indo-Scythian ambassadors ‘were from nations previously known to us only through hearsay and they petitioned for the friendship of Augustus and the Roman people’. This was a period when the Sakas still ruled most of the Indus region, but were being threatened by the Parthians. The Sakas were probably looking for a military alliance with Rome in the expectation that Augustus was planning to conquer Persia. This would explain why Orosius links the embassy to eastern conquests and claims that the ambassadors came to ‘praise the Emperor with the glory of Alexander the Great’. This embassy was probably sent by Azes who was the last Saka king to rule in Indo-Scythia. The Sakas were influenced by Greek culture and Azes issued currency displaying images of the goddess Athena. He also used Greek titles on his coins and referred to himself as ‘The Great King of Kings’. King Azes was probably responsible for a second embassy that reached the Roman Empire in 22 BC. On this occasion the Saka ambassadors sailed to a port on the Persian Gulf and travelled overland to Roman Syria. In Antioch they were received by Roman authorities and taken to the Greek island of Samos where Augustus was holding court and receiving African envoys from Meroe. Strabo reports that only three of the ambassadors survived the journey from India, ‘the rest had died chiefly by consequence of their long trek’. The ambassadors carried a letter from Azes to the Emperor written in Greek on a vellum scroll. In it Azes explained that he held the allegiance of 600 minor sovereigns in northern India and ‘was anxious for an alliance with Caesar Augustus’. His Indus possessions were about to be conquered by the Parthians and he proposed a military pact similar to the deal agreed between Alexander and the Indian King Porus. Strabo had an acquaintance named Nicolaus who saw the letter from Azes when the ambassadors were being taken to Antioch. He reported that Azes was ‘ready to allow Augustus passage through his country, wherever he wished to proceed and co-operate with him in anything that was honourable’. According to Dio a ‘treaty of friendship’ was agreed between the two rulers, but by this stage Augustus had begun to seek peace terms with the Parthians and these superseded his plans for any further eastern conquests. This diplomatic contact occurred in the first decade of Indo-Roman trade when the sight of Indian visitors was still a novelty for most subjects of the Empire. Nicolaus describes how the ‘gifts brought to Caesar Augustus were presented by eight naked servants besprinkled with sweet-smelling odours and clad only in loin-cloths’. Roman crowds marvelled at an armless Indian youth sent by Azes who was proclaimed a ‘living Hermes’ because he resembled the pillar-statues erected in Greek cities to honour the god of expeditions and commerce. Dio describes how the boy could ‘use his feet as if they were hands and with them he could pull a bow, shoot missiles, and put a trumpet to his lips’. The traditional symbols of Hermes included the tortoise, the rooster and a staff called the caduceus which was decorated with two intertwined snakes. This is probably why Azes sent Augustus an exotic pheasant, a large tortoise, a brood of colourful Indian snakes and a giant python. The bird was probably a Himalayan Monal Pheasant which displays metallic-coloured plumage ranging from blue-greens to purple and copper-reds. It was probably symbolic of the mythological phoenix that was said to make its nest from cinnamon twigs. Dio claims that the envoys also brought tigers, and ‘this was the first time the Romans and probably the Greeks had seen these animals’. Augustus displayed these exotic wonders to astonished crowds in Athens and Rome. Strabo reports ‘I myself have seen this Hermes – the man born without arms’. The Saka ambassadors who visited Augustus were accompanied by a Buddhist or Jain missionary who came from the Gujurat city of Barygaza. This holy man was known in India as a shramana (a monk or religious instructor), but the Romans took this title to be his personal name and called him ‘Zarmarus’ and ‘Zarmano-chegas’ (‘Teacher’ or ‘Master of Shramanas’). Zarmarus probably sought patronage from Augustus and may have requested permission to establish a Buddhist or Jain monastery in Rome, Antioch or Alexandria. His request was denied, but Zarmarus remained in the company of the Emperor when he travelled to Athens in 21 BC. In Athens Augustus was accepted into a secretive and exclusive Greek cult called the Eleusinian Mysteries which promised its followers rewards in the afterlife. Augustus used his influence to have Zarmarus initiated into this cult so that he could witness some of the most ancient and enigmatic practices involved in Greek religion. Zarmarus decided to exhibit his Indian faith and asked to be burned alive in a funeral pyre. His request was granted by the Emperor and Dio indicates the bewilderment of the Greek crowds who gathered for this occasion. He writes, ‘for some reason Zarmarus wanted to die’ and concludes, ‘maybe he wanted to make a display for the benefit of Augustus and the Athenians’. Plutarch pointed out that the event resembled a ritual performed for Alexander the Great, when an Indian sage named Calanus renounced his position as advisor to the king and immolated himself on a funeral pyre in front of the assembled Macedonian army. Strabo describes the scene witnessed in Athens by the Emperor when Zarmarus ‘anointed his naked body with fragrances and wearing only a loincloth, leaped upon the lighted pyre with a laugh’. Augustus arranged that the cremated remains were placed in a tomb at Athens and the event commemorated with the text, ‘Here lies Zarmanochegas, an Indian from Barygaza, who immolated himself in accordance with his ancestral customs’. When Plutarch wrote his Life of Alexander, he describes the self-immolation of Calanus and mentions how the memorial to Zaramos had become an attraction in Athens. He reports, ‘the same ritual was performed by an Indian who came with Caesar to Athens and they still show you the Indian’s Monument’. Augustus took great pride in elevating the Roman Empire to a position of world recognition. His memorial testimony is preserved in an inscription that records, ‘to me were sent embassies of kings from India, who had never been seen in the camp of any Roman general’. However, his interest did not go as far as military intervention and by 10 BC the Parthians had conquered most of the Indus Region (Indo-Scythia). The Saka Kingdom was reduced to Gujurat with Barygaza becoming the main port for the diminished regime. During the first century AD Gujurat was ruled by a Saka King named Nahapana known to Roman traders as ‘Manbanos’. This entry was posted in Roman, Trade by MSW. Bookmark the permalink.